And now for some news that might send at least a few old-school Bimmer enthusiasts crying into their beers: BMW says they are planning at least five front-wheel drive cars, starting with the new 2-Series Active Tourer. The age of the FWD BMW begins in earnest. Automotive News Europe reports that the BMW Group is planning a whopping 45 model range; 30 of them will be rear-drive based, and 15 will be front-drive based. Now, that number includes new Mini models, but also includes five BMW-badged front-drivers too. In the past we basically had two rear-wheel-drive platforms. One was centered on the 1 and 3 series and their respective X models and the other on the 5, 6 and 7 series and larger X models. In the future, we will converge all our rear-wheel drive and X models on a single, highly flexible architecture. Emphasis mine. It sounds like they're taking a page out of the Volkswagen playbook and what they're doing with the MQB platform. It's pretty smart and cost-effective when you think about it. 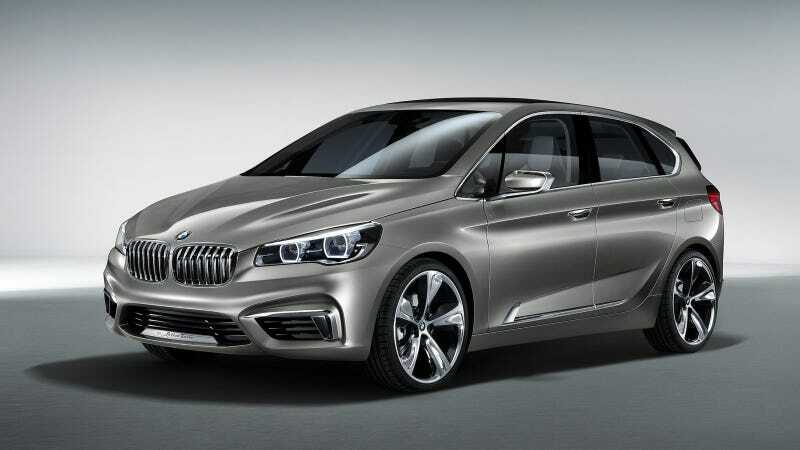 BMW will be doing the same thing with modular three, four and six cylinder engines. And as much as we enthusiasts hate to admit it, building front-drive Bimmers makes sense in a lot of ways. BMW, like everyone else, faces tighter fuel economy standards, and as Diess said, Europeans are buying far less 5- and 7-Series cars than they used to, and the trend in the Old World is toward smaller premium cars. They have to do what they have to do, right?